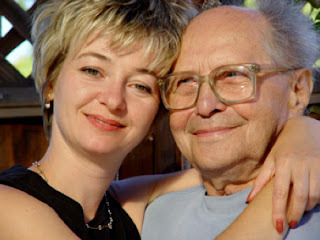 The CareGiver Partnership: "Please let me stay with you. I promise I won't eat much"
"Please let me stay with you. I promise I won't eat much"
“Don’t put me in there. This place is for crazy people. Please let me stay with you." This is what my Father told me as I was driving him to the assisted living facility. It was only a couple of months after Mom passed that Dad started having trouble. It began with little things like forgetfulness and confusion, but soon escalated to where he was having trouble with even the simplest of tasks. I remember him calling for help to turn off his car's headlights. We started getting calls from neighbors, the bank and restaurants saying “something is wrong with your Dad”. A medical examination showed he had the early stages of Alzheimer’s Disease. The first thing we did was to take away the car keys. Next, our family coordinated regular visits to his house to make sure his needs were taken care of and that he was safe. When we found dad sleeping with all of the stove burners on high, we realized we couldn’t leave him alone ever again. My brother, sister and I scheduled rotating shifts in which one of us would stay with him at all times. This was a good short term fix but soon we realized this was not something we could sustain. Now what? None of us wanted to put our Dad into ‘one of those homes.’ I decided that dad would move in with us where we could watch over him, keeping him safe and comfortable. Things went well for several weeks but as his condition worsened he needed constant monitoring and care. We were simply not able to keep up. Reluctantly, the family made the decision that Dad needed to be in an assisted living center. After visiting every center in the area, we made an informed choice on where Dad would get the best care and be the most comfortable. The center was clean and well kept and the staff was experienced, pleasant and caring. To minimize the stress of the transition on dad, we spent several days moving familiar furnishings and favorite things into his new room. As I drove Dad into the center he had an uncharacteristic moment of clarity saying “Don’t put me in there. This place is for crazy people. Please let me stay with you. I promise I won’t eat much”. I assured Dad everything was going to be okay and that I would be there to see him every day. As I helped Dad out of the car he suffered a heart attack. The guilt I felt was overwhelming. My Father survived that heart attack and went on to live comfortably in the assisted living center for eight months until his death at the age of 82. As I look back I think our family did everything we could to protect and care for dad; I only hope he understood that. About The CareGiver Partnership. Lynn Wilson founded The CareGiver Partnership based on her experience in caring for loved ones as well as providing the highest level of customer service. She takes pride in offering personalized attention service that helps her customers find solutions. Now that her children are grown, Lynn enjoys spending time with her granddaughter while also helping to care for her mom. To find out how The CareGiver Partnership can serve you, call 1-800-985-1353 M-F 9-4 CDT.